To show off just how light the MacBook Air is, an Apple Store came up with this awesome window display, yes that is a MacBook Air hanging from a balloon. OK so the balloon itself isn’t the only thing holding up the MBA, it’s also held in place by some wires, but who cares? It looks awesome and gets the point across. This is easily the coolest window display the Apple Store has had yet, and some user reports say it is being adopted nationwide. Maybe Apple will start showing MacBook Air’s used as cutting boards too? 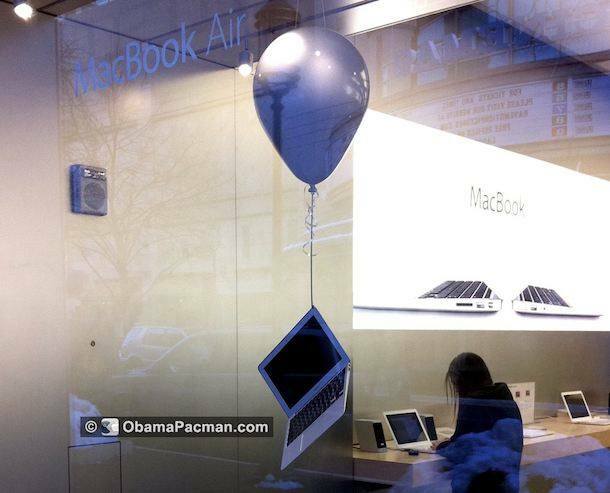 The picture and video are from ObamaPacman, although the specific Apple Store isn’t given, that site appears to be based in Washington DC so presumably this floating Air display is from that region as well. Congratulations. Old news. The Apple Store Walnut Street has had this for weeks. Old news for you, may the rest of the world be told about this? Anyways, thanks for the article, very cool advertisement indeed. The 11″ MBA weighs 1 kg, so you would just need something like a 4′ diameter helium balloon to hold it up. Uhh, you would need a few more than that to hold up a Kg, in fact you would need around 914 liters of helium to lift this weight at 20c. A 4′ balloon will only lift around 112g based on a foot of helium lifting roughly 28g, so it would lift up the 0.06Kg the MBA is over 1Kg no problem. It would be a lot cooler if the MacBook Air was running a demo. This has been around for a long long time and btw as a response to Louis: The macbook air at my local store is running a demo!! It is sweet!! !